A p-value offers little insight into the data. It may indicate that there is an association, but does not identify the nature of the relationship. A mosaic plot expresses the deviations from independence. On the Analyse-it ribbon tab, in the Compare Groups group, click Mosaic. A mosaic plot is added to the analysis task pane. In the Split drop-down list, select Y. In the Color by drop-down list, select Residual. The mosaic plot represents the counts in a contingency table by tiles whose area is proportional to the cell count. 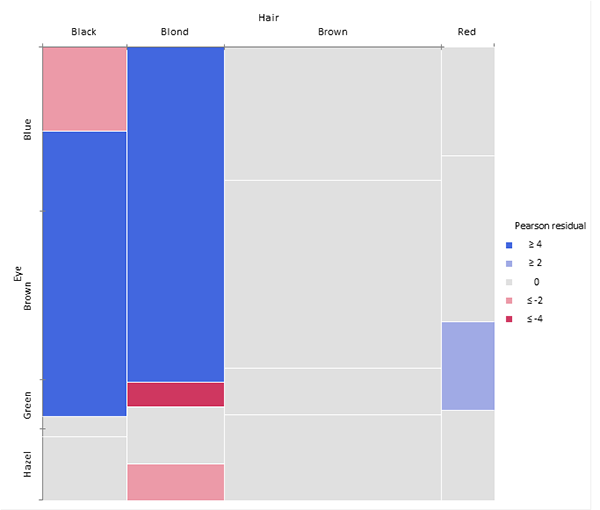 Column widths show the marginal proportions of hair colors. The heights of the tiles show the conditional frequency of eye color given hair color. Under the null hypothesis of independence, the heights of the tiles in each row should be the same. It is easier to see the deviation from independence by coloring and shading the tiles by the residuals from the Pearson test. Positive deviations are blue, negative red. The absolute value of the residual is shown by the shading; cells with residuals less than 2 are unfilled; cells >= 2 are filled; those >= 4 are filled with a darker pattern. Under the assumption of independence, these values roughly correspond to two-tailed probabilities p < .05 and p < .0001 that a given value of exceeds 2 or 4. You can see from the mosaic plot that Black/Brown and Blond/Blue are over-represented, while Blond/Brown is under-represented.